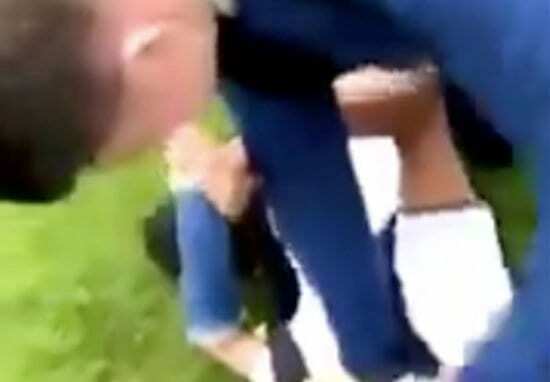 A video recorded by school ground bullies went viral and finally shamed English police and school authorities to act in defence of an injured Syrian refugee boy. Having just returned from the Turkish city of Şanlıurfa near the Syrian border after opening an orphanage for Syrian girl refugees I was feeling on quite a high. More often than not I leave that part of the world in despair over the atrocities I’ve witnessed and stories I’ve written but this occasion was upbeat. I left behind 45 young Syrian girl orphans aged seven through to their teens who had been given a new start in life and judging from the optimism and smiles on their faces I know the only way for them now is up. So imagine how my horror when my mobile phone began emitting a series of bleeps as I switched it on at London Heathrow. Numerous copies of the same video had been sent to me from friends and colleagues who were deeply alarmed by its contents. The video showed a Syrian boy called Jamal being headbutted, knocked to the ground and treated to a mock waterboarding … at a school in England! Furthermore, it had been uploaded on the social networks by at least one other thug from Almondbury High School in Huddersfield who laughed and goaded the teen bully as he set about the already injured Syrian refugee child wearing a plaster cast. To think this child escaped a war zone two years ago after suffering under the tyrannical dictator Bashar al Assad, witnessing untold atrocities only to arrive in the UK and be exposed to racist-driven thuggery in daylight, on school premises beggars belief! Within months of entering the education system Jamal and his sister, the only Syrian children in their respective classes, were targeted and set upon by a number of other students with a campaign of racist bullying. Not only had Jamal been exposed to verbal and physical abuse numerous times within the school and around its precincts, says his family lawyer, but school staff were fully aware of the problem. Despite taking notes the school failed in its care of duty to protect Jamal who was beaten up so severely by four other pupils that his arm was fractured. the matter was reported to both police and the school and yet not ONE pupil appears to have been questioned or excluded. Jamal returned to the school with his arm placed in a cast and within days the same gang of boys set about him again as they headbutted, strangled and attempted to waterboard him. Had the video not gone viral I doubt the school or the police would have done little or nothing as in the past, but they have all now been shamed into action following public outrage. Does it really take a campaign on Facebook and Twitter for the authorities in Huddersfield to do something to protect a child who has already witnessed enough thuggery, brutality, cruelty and other atrocities in war-torn Syria? Frankly, I don’t want to hear any weasel words and excuses from the authorities or the parents of those thugs. Children aren’t born with this sort of hatred, it is learned and developed and encouraged. Whether this festering bigotry, racism and hatred was nurtured at school, in the home or the community remains to be seen but I, for one, am deeply ashamed that a refugee child cannot be offered the protection he deserves on these shores. Ofsted must carry out an instant investigation to audit the school’s safeguarding policies. And local police who interviewed the victim about his broken arm more than a month ago has now finally jumped into action which could result in the main culprit being charged today … only because a video went viral and triggered global outrage. Shame on the thugs, shame on their families, shame on the police, the school and anyone else who looked the other way. To Jamal, his sister and the rest of his family I would like to apologise and hopefully, they will know by now that all of those who failed them are in a minority. They have let you down but by now you should realise that you have the support of the majority of people who refuse to let the bullies win.